For more than 125 years, SIMONSWERK has been one of the most well-known manufacturers of door hinges and hinge systems for heavy-duty, residential and entrance doors. Committed to high quality standards, the company is always willing to innovate and strives for long-lasting customer relationships. Our modern, high-quality products are the basis of our success. They are our answer to the wide range of requirements posed by lots of different application areas. SIMONSWERK GmbH acquired leading UK brass hinge manufacturer Hinges & Things in December 1999 in order to broaden their European product portfolio of primarily steel hinge systems and hardware, with the addition of brass hinges from the UK. 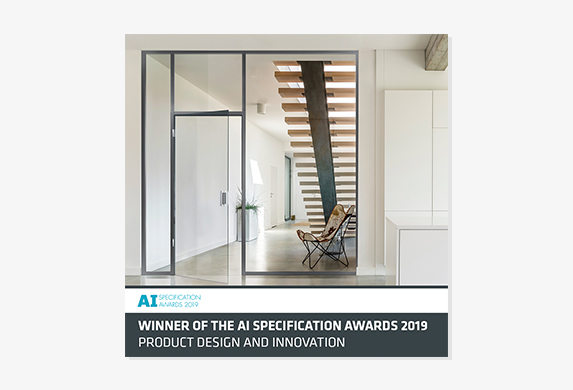 SIMONSWERK UK are pleased to announce that the new TECTUS Glass has been awarded ‘Product design and innovation’ category 2019 at the Architectural Ironmongery Specification Awards. Organised by the Guild of Architectural Ironmongers and in conjunction with the Royal Institute of British Architects (RIBA). The category is new for 2019 and has been created to celebrate new door and window hardware products, allowing advancing technologies to be fully showcased and recognised. The new TECTUS Glass provides aesthetic and functional solution for the minimal, flush-fitting installation of glass doors. The completely concealed hinge system creates a flush door structure for interior rooms. The design of the hardware solution is elegant and minimalistic. The GAI has created five CPDs which have been approved by the Royal Institute of British Architects. As they are RIBA approved, architects will be able to receive double learning points for attending a presentation of any of the CPDs. The SIMONSWERK RIBA approved CPD provides architects with the technical knowledge for specifying the correct hinge for the right application. The presentation offers guidance on door specification, legislation, building regulations, fire and safety in use and CE marking. The SIMONSWERK management team is ideally qualified and available to present CPD seminars covering all aspects of door hinge fitting including grade of hinge to use, specification for fire doors and the number of hinges which should be used to fit a single door. Please contact us to book our RIBA approved CPD. SIMONSWERK GmbH acquires the Colcom Group S.p.A. from the Italian private equity company Wise Equity SGR S.p.A.
Give us a call, send us a fax, write us an e-mail or we will come and see you – we are happy to provide help and advice.